The Revue brand sold Praktica cameras under their own name Revueflex. To complete this fact, they also used the Pentacon lenses with an Auto Revuenon name on them. They are exactly the same lenses, as you can see in the picture. Specifications equal the original Meyer Oreston, please check that page too. 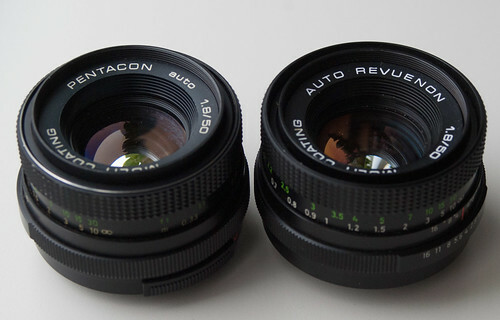 The Pentacon versions, and this Revuenon, were improved with Multi-Coating. This page was last edited on 3 December 2014, at 15:50.